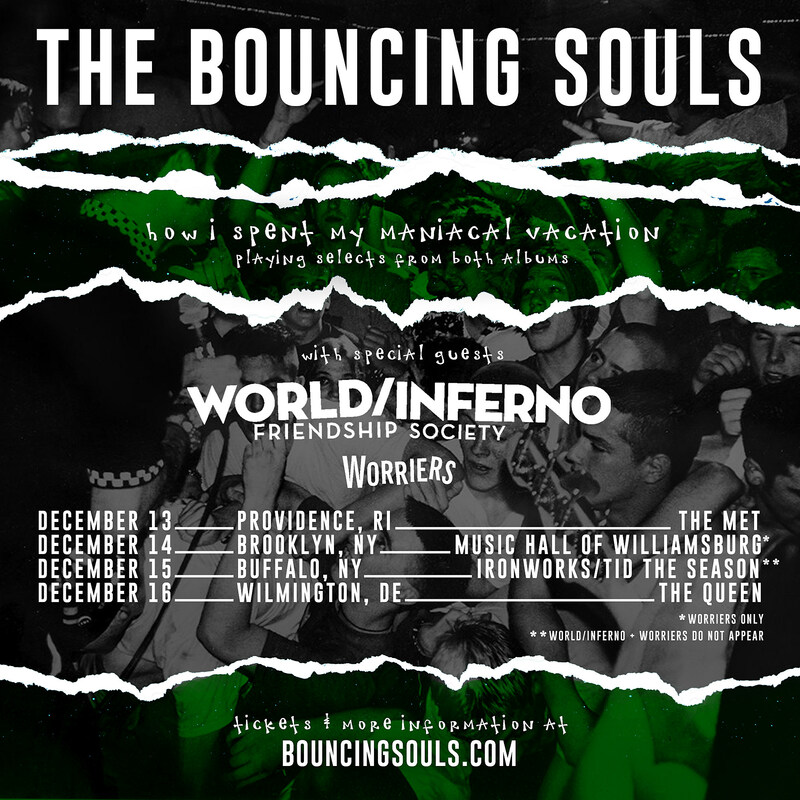 NJ punk heroes The Bouncing Souls have announced a short run of Northeast shows for December called How I Spent My Maniacal Vacation, and as the name implies, that means their setlists will pull “heavily” from two of their most-loved albums, 1996’s Maniacal Laughter and 2001’s How I Spent My Summer Vacation. It includes their set at Every Time I Die’s stacked holiday show in Buffalo (with Snapcase, The Menzingers, Turnstile, and more), as well as headlining shows with punk cabaret vets The World/Inferno Friendship Society and Brooklyn punk staples Worriers. The run includes a Brooklyn show on December 14 at Music Hall of Williamsburg. Tickets for that show go on sale Friday (10/19) at 10 AM with an AmEx presale starting Wednesday (10/17) at noon. UPDATE: Contrary to what was written on the original poster, the Brooklyn show is just worth Worriers, not World/Inferno. New poster below. Sooner than that, The Souls have another short Northeast run with Swingin’ Utters this weekend, beginning with a sold-out Rocks Off Cruise in NYC. All dates are listed below.